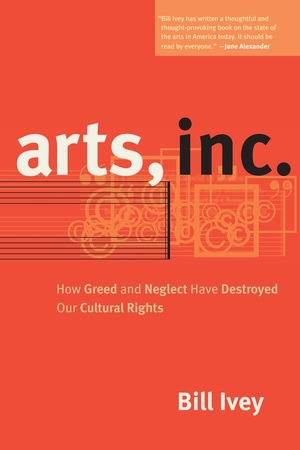 In this impassioned and persuasive book, Bill Ivey, the former chairman of the National Endowment for the Arts, assesses the current state of the arts in America and finds cause for alarm. Even as he celebrates our ever-emerging culture and the way it enriches our lives here at home while spreading the dream of democracy around the world, he points to a looming crisis. The expanding footprint of copyright, an unconstrained arts industry marketplace, and a government unwilling to engage culture as a serious arena for public policy have come together to undermine art, artistry, and cultural heritage—the expressive life of America. In eight succinct chapters, Ivey blends personal and professional memoir, policy analysis, and deeply held convictions to explore and define a coordinated vision for art, culture, and expression in American life. Bill Ivey was the chairman of the National Endowment for the Arts from 1998 through 2001, was director of the Country Music Foundation from 1971 to 1998, and was twice elected Chairman of the National Academy of Recording Arts and Sciences. He presently serves as founding director of the Curb Center for Art, Enterprise, and Public Policy at Vanderbilt University. "Walt Whitman was democracy's eloquent poet who understood that democracy is not just a form of government but a way of life rooted in culture. Bill Ivey is culture's eloquent advocate who knows that as democracy needs the arts, the arts need the advocacy of government. His manifesto Arts, Inc. is a passionate attack on the commercialization of culture and a plea for a cultural bill of rights that will restore to all Americans their right to a heritage, to creative expression and to a creative life. This is not just a vital book about the arts, but a vital book about democracy." —Benjamin R. Barber, author of Jihad vs. McWorld and Consumed.